There’s a lot to like about the way “One Watson, One Holmes” opens. No, I don’t mean the first scene, where we find Sherlock training himself to mimic death and answering a knock from a member of Everyone, although that scene was fine as well. No, I am referring to the “Previously On” sequence, designed to help audiences who pay less attention to Elementary than you and I do follow the episode in question. Typically, these are reserved for episodes that we would identify as tied to ongoing serial storylines—in this episode, for example, Sherlock refers indirectly to major events in Joan’s life, which theoretically could have been included in the “Previously On” to remind viewers that she was nearly murdered by a mob boss, and that her boyfriend died in the process. While there is no reason for this reminder to exist given the episode makes perfect sense without it, that’s the typical logic we would ascribe to these segments, particularly in the context of a broadcast procedural where there is an expectation that people would drop in and out at will (because the business model is predicated on them being able to do so). However, every scene in the “Previously On” sequence for “One Watson, One Holmes” refers back to scenes that are serial in a different way than major character events. It is a catalogue of references to the anonymous hacker collective Everyone, which the show has used on multiple occasions as a way to work through the procedure of investigations. While originally introduced as a threat to Sherlock and Watson, they have emerged as a fair-weather ally, one the show has made good use of in order to appeal to viewers like us. Each time Everyone emerges, we get the (mental) image of Sherlock in a dress singing “Let It Go,” or Sherlock presenting an impassioned Twilight essay, and the show’s typical investigatory rigmarole is given a stronger inflection by the show and its point of view. While not precisely a recurring “character,” Everyone nonetheless reinforces the distinctiveness of the show’s universe, in the process building a new breed of Irregular for Sherlock to turn to. The “Previously On” sequence may be there primarily so that those who haven’t seen those episodes can better understand the episode that follows (which still has plenty of exposition in its own right), but I’m choosing to take it as the show celebrating an accomplishment as it takes a victory lap. “One Watson, One Holmes” is a great example of the way procedurals function cumulatively, pulling the trigger on an episode that goes all-in on the accrued interest the audience has in Everyone and their activities. Beyond building an engine for humor, the show created an entity that can contain mysteries of its own, and investigating the murder of one of Everyone’s inner sanctum unveils a web of events that supports one of the show’s stronger standalone outings. The design of the episode—credited to Robert Hewitt Wolfe—begins in the aforementioned opening scene, as “Sucking Chest Wound” shows up at Sherlock’s door. It’s important because the episode doesn’t open with the murder of “Species” for which “Sucking Chest Wound”—or Petros, as he’s known offline—is ultimately framed. Instead, we get a chance to meet the would-be suspect outside of the context of the murder, and then even get to spend some time with Joan at the library working a low-stakes case of a teenager cyber-bullying herself for attention. Not only do we get the great glimpse into the mundane, something the show often skips in favor of the spectacular, but we also have someone within the investigation that we can relate to as it unfolds. There’s never any chance Petros is actually the person who committed the crime, but because the episode allows him to be a real character it doesn’t toss him away like the show tends to do with temporary suspects. “One Watson, One Holmes” avoids tossing away anything. In addition to keeping Petros around as a story generator, with Sherlock and Joan visiting him twice in order to get more information and transition to a new stage of the investigation, the episode moves from suspect to suspect with purpose. “Monkey vs. Shark” may have been a false suspect, but the subsequent conversation offers more information, and delivers Species’ “stash” for Sherlock and Watson to sift through. 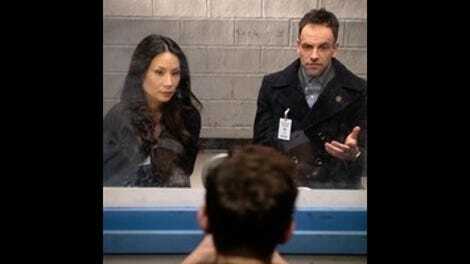 Moreover, when they eventually land on Brady Dietz as their prime suspect, their attempt at arresting him involves the FBI, and subsequently delivers a new person of interest Sherlock must solve in order to get at the person he’s convinced is the killer. It’s true that many of these elements were purely “procedural” in the end, but more than other episodes this felt like an investigation that kept expanding instead of an investigation that was being forcibly expanded through false leads and narrative stall tactics. At each level, Sherlock and Joan found something bigger, whether it’s a think-tank guarding military secrets or an FBI investigation that’s harboring the real murderer. Everyone’s large reach, as demonstrated in previous appearances, becomes an excuse for an episode that has phone calls with the NSA, 80s children shows, a new forensic accounting Irregular (Mr. Briggs), and a case that could have kept expanding if the show had two hours instead of one. While I initially feared that finally doing another case-of-the-week revolving around Everyone would drain the organization as a resource, the gradual unfolding of the story reinforced that this particular well is not going to run dry anytime soon, even if a murder stemming from a civil war sparked by an FBI sting operation using one of two people using an alias on the site is off the table for the future. That the episode managed all of this while including the strong Sherlock and Joan runner that gives the episode its title is impressive. One of the show’s strengths in its first season was finding space for stories like this one amidst more typical episodes, and here we see a very simple story that speaks volumes thanks to what we know about the characters. It’s a particularly strong example of the way Sherlock’s character works to create arc structures in “character beats” like these simply through his personality. Initially he’s flummoxed, avoiding his discomfort with Joan’s silence and isolation by running off to read books about metallurgy at the library. Then, he gradually noses his way into Joan’s life as she receives texts about the bachelorette party, before eventually breaking down and admonishing her for isolating herself, but entirely focused on how this inconveniences him. He then takes some time to reflect, realizes he has made an error, and finds a better way to get Joan to reflect on her self-isolation that shows greater self-awareness, which Joan takes to heart. I recap it here not to insult your intelligence like some “Previously On” sequences, but rather because none of this feels like a stretch. Joan’s behavior is perhaps a little exaggerated to prove a point, but Sherlock is constantly prodding at Joan in every episode, and the conflict that gives the story its turning point comes from Sherlock’s basic personality as established in the season’s earliest episodes, as opposed to him acting out of character. At the same time, though, Sherlock is also different than he was then, so we get a clearer arc where he shows self-awareness and finds a way to get through to the person who taught him a working definition of the word friendship. The characters are at a point in their relationship where major breakthroughs are unlikely, but Sherlock is still enough of a narcissist that stories like this still have their ups and downs, and their resolution still resonates as another chapter in a complex and dynamic relationship of one Watson and one Holmes. 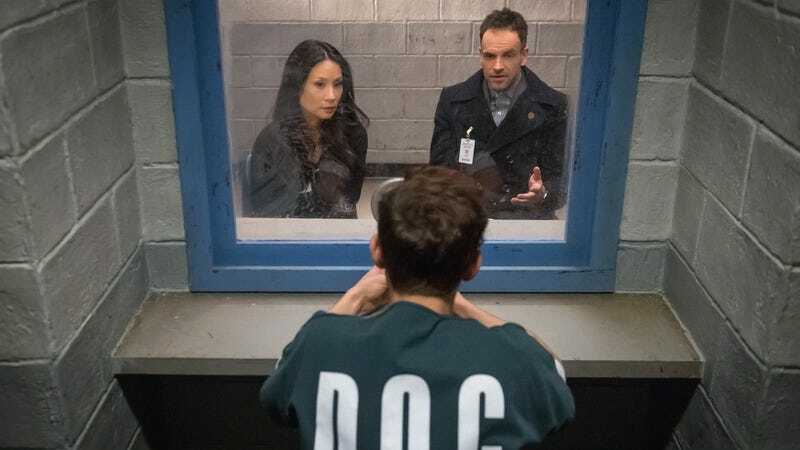 “One Watson, One Holmes” has some issues in its ending, conveniently pulling a Tibetan nanny out of its hat and never quite explaining how the crime itself was committed (and, in particular, how Petros was framed for it). However, rather than signifying a case that was lazy, these moments are the mark of an episode that had so much going on that the bounds of 40 minutes could not contain it cleanly, and that’s ambition that should be acknowledged and rewarded. Seriously, they bring up the photo of Sherlock in a dress being Species’ desktop image and we still don’t see it? You have to follow through eventually, show. “Why are those guys bringing a python into the house?”—I appreciated that they didn’t let the surveillance scene go by without throwing in something random. Joseph Cross, who played Petros, reminded me a lot of Dominic Monaghan with the way the character was dressed/styled, but that just might be from writing about Lost for almost a year now. “Mason is currently grounded from the internet”—I appreciated this shoutout to a missing Irregular (and wish we had more of them for Ms. Hudson, among others), but I’m mainly quoting it because The A.V. Club is no longer capitalizing internet, and I wanted to express my existential struggle with this fact. I loved the withering look Mr. Briggs gave when Joan acted surprised that Sherlock could follow the financial breakdown he generated. I hope we see more of Briggs. Waking Up Watson: I figure it’s time we give this its own recurring column, so let’s add “Typing ‘Waking Up Watson’ In Morse Code” to the list, and hope we someday get a “Previously On” sequence that’s just Sherlock waking up Joan over and over again. Clyde Watch: Okay, so here’s the thing. Obviously, I was thrilled to see Clyde—it’s been too long, and I’ve been worried, and I needed the joy Clyde brings for this busy week, in particular. However, speaking of existential struggles, I am concerned by Clyde’s lack of appreciation for T-Swift herself, Taylor Swift, as learned through Sherlock’s study of his listening preferences. To fundamentally dismiss her entire catalog is the kind of rash, judgmental statement that I thought Clyde was above, and this has thusly thrown my entire assessment of his character into disarray. I’ve tried to overcome this by writing this entire review while listening to one of Clyde’s favorite songs, “Free To Be You And Me”; however, despite the song’s thematically appropriate appeals to the value of individual freedoms, I find myself concerned that Clyde and I are not as compatible as I originally thought. Has he heard “All Too Well?” Has he seen her Tumblr? We need to talk about this, Clyde.